See January Magazine’s interview with Barker here. 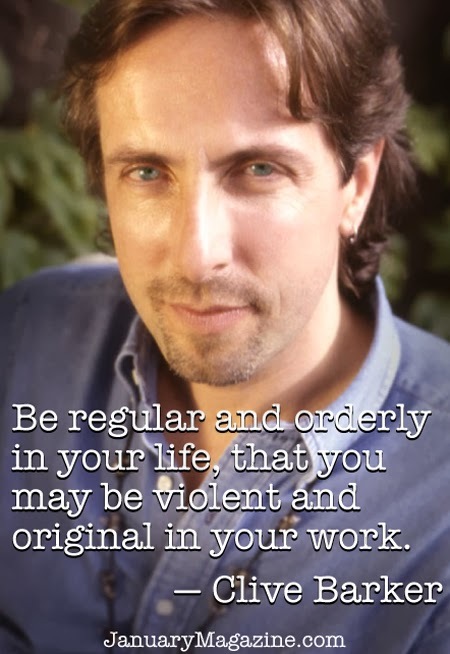 Um, believe that Gustave Flaubert's quote first..."Be regular and orderly in your life, that you may be violent and original in your work." Clive Barker might have repeated it, but the quotation comes from Gustav Flaubert. Not a Clive. barker quote. the line was used in the comic jihad #1 by pinhead, but Clive barker didn't write the comic. I'm sure Barker is embarrassed to see this *famous* quote from Flaubert attributed to him over and over and over again. Get it right, internets! The world didn't start in 1995.